Travel in the footsteps of St Augustine and discover the birth of Christianity in England in the beautiful Stour Valley from Ramsgate to Canterbury. The route can be walked in either direction and there are also some related itineraries such as a “river pilgrimage” from Sandwich, good local cycle routes, and the possibility of canoeing the route too. Don’t forget to pick up your pilgrim passport at the start of your journey, at the Welcome Centre in Canterbury Cathedral or the Shrine of St Augustine in Ramsgate, and to get it stamped along the way. Some restaurants are offering a discount for pilgrims on the Way of St Augustine with the passport. Pilgrims are welcome in Canterbury Cathedral free of charge, and blessings and group visits can be arranged through Cathedral House. Visit this places while on your pilgrimage and dont forget to get your passport stamped! The World Heritage Site comprising St Martin’s Church, St Augustine’s Abbey (English Heritage), and Canterbury Cathedral. There are also pubs and restaurants along the route, at Fordwich, Stodmarsh, Grove Ferry, Pluck’s Gutter, and Minster – perfect for stopping for refreshment! We ask pilgrims on this route (of all faiths or none) to tread lightly on the Way of St Augustine, and to be as environmentally conscious as possible. Take nothing but photographs and leave nothing but footprints. Please support local producers of food and souvenirs. And please do share your experiences on social media with the hashtag #canpilgrim. CANTERBURY TO RAMSGATE - Start at Eastbridge Hospital, on the High Street in Canterbury the 12th Century hostel for pilgrims. (£2 entrance fee , open 10am to 5pm, Monday to Saturday). The next stops take in the three sites which form the World Heritage Site in Canterbury – the Cathedral, the Abbey and St Martin's Church. From Eastbridge Hospital turn right to walk up the High Street, turning left into Mercery Lane towards the main Christchurch gates of the Cathedral, founded at the end of the 6th Century by St Augustine. Pilgrims can pick up their Way of St Augustine passport at the Welcome Centre, and collect the first stamp, and, if there is a chaplain available, have a blessing for the journey. Groups of pilgrims should arrange a visit with Cathedral House (email visits@canterbury-cathedral.org). St Augustine's Chair, where all Archbishops of Canterbury are enthroned, is the inspiration for the logo for the Way of St Augustine. The Cathedral is open to the public 9am to 5.30pm in the summer, 5pm in the winter every day except Sunday, when it is open 12.30-2.30pm. Adult admission £10.50. Please see the website for full details and service times. Walk east through the Cathedral grounds to exit the precincts through the memorial garden and Queningate, perhaps pausing to reflect on the stone inscribed with a quote from William Wilberforce. Cross the car park and the road, to Lady Wootton's Green, walking through the centre of the green, to see brass statues of King Ethelbert and Queen Bertha, who welcomed Augustine to Kent. The gate house in front of you was once the imposing entrance to the Abbey. Turn right into Monastery Street, and then bear left into Longport, where the brick wall of St Augustine's Abbey is on the left. There is a visitor centre here for the English Heritage site. Full details on their website, but in brief English Heritage members – free, Adults £5.40. Open 10am-6m all week, March to Sept, then 10am to 5pm Weds to Sun in October, then Nov to March open Sat & Sun 10am – 4pm. Please check times before visiting! The Abbey was founded in 598 by Augustine, and at first was a burial ground, but soon had a huge church and other buildings, which along with the Cathedral would have provided an imposing sight for pilgrims of old. St Augustine is buried in the grounds, and a plaque marks his resting place. Passport stamp available here. Turn left out of the Abbey, and walk along Longport, turning left into North Holmes Road, to visit St Martin's Church, where Augustine established his mission in Canterbury, at the invitation of Queen Bertha. There is a wonderful view of the Cathedral from the top of the cemetery. The church is open Tuesday, Thursday and Saturday 11am to 3pm, Sundays 9.50am to 10.20am. Visits on other days may be arranged after prior notice by sending an email to Ruth Matthews on visits@martinpaul.org. Passport stamp available here. From the church gate, turn right and then bear right into St Martin's Avenue, where you will pick up the Stour Valley Walk. The Conduit House for the Abbey's water supply is a short detour off to the left after a few minutes (English Heritage – access free), and can be seen below the path. Continue in a straight line, crossing a large metal stile, and carrying straight on into the woods. There is a place where about five paths seem to converge – carry straight on and down, and soon you will see signs for the Stour Valley Way again. About 0.75km after entering the woods, there is a fishing pond on the right. Another 0.5km after this, there is a junction where bearing to the left leads to the meadows at Fordwich, which is a delightful way to enter the village, but is a permissive path and a cycle route. The Stour Valley Way goes straight on, and enters the village near the George and Dragon pub, and one of the old 1997 “Augustine Trail” signs. The historic and ancient Cinque Port of Fordwich, possibly the smallest town in England has 2 pubs, a delightful timber framed Town Hall, and the church of St Mary the Virgin, now owned by the Churches Conservation Trust (CCT). The church houses the mysterious “Fordwich Stone”, believed to be part of the shrine of St Augustine which was once a place of pilgrimage itself when it was at St Augustine's Abbey. There are also some amazing box pews, which can be home for a night if you want to try “champing” (church camping), by arrangement with the CCT. It is also possible to canoe most of the route from Fordwich. Passport stamp is available here. Follow signs near the Church and Fordwich Arms for the Stour Valley Walk, which goes through woods, past lakes and comes out onto higher ground after approx. 2km. Walk along the edge of the field, when you first emerge from the wood, and then take the diagonal path across the next field to join Stodmarsh Road for approx. 0.5km before taking a parallel path and then the road again into the village of Stodmarsh. If you visit The Red Lion Pub, the entrance is around the side! A pilgrim stamp is available in the tiny church of St Mary Stodmarsh, which is a very short detour into the village. 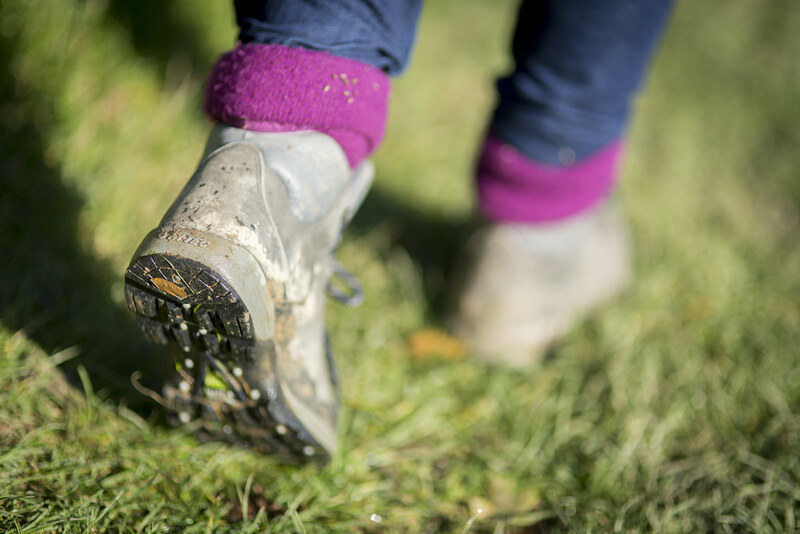 Retrace your steps to re-join the Stour Valley Walk, and when you come to the interpretation panels in the car park for the Stodmarsh National Nature Reserve, take the sensory trail to the right, and then follow directions to the hide, turning right at the junction in the woods. After approx. 1.2km the path takes a sharp turn left, then another to the right after the hide, approx. 0.5km further on. The path heads straight across the marshes for approx. 1.7km, where you emerge by the Grove Ferry Inn, pleasantly situated next to the river for a relaxing drink. After the Inn, pick up the Saxon Shore Way in the picnic area, walking east along the river, and then turning inland at the red bridge, where there is a house with an upturned boat for a porch. You will see oasthouses, in the distance - these are next to the church which is the next stop. Also look out for local historic information about the Wantsum area at this point. At the pumping station turn right to walk across the footbridge and walk approx. 0.5km until you reach the road into West Stourmouth. Turn left and walk along Church Road, until you find the church of All Saints, West Stourmouth on the right. This is another Churches Conservation Trust church, and is approx. half way along the Way of St Augustine. Overnight “champing” stays may be arranged here through the CCT. If staying overnight at the church, in the evening, it's a pleasant walk to the Rising Sun (also B&B accom) in East Stourmouth along the Stour Valley Walk, which runs through the churchyard and into orchards. Advisable to phone ahead to the pub. Passport Stamp is available at the church. From the Church, turn right and walk along a track to the left of the oast houses, to a trackway which bears right to join the river and the Saxon Shore Way. Walk along until you get to the road bridge and turn into the Dog & Duck Pub at Pluck's Gutter. Take the road bridge across the river. There is a path on the north bank of the river, but it's not always easy walking, so walk up the road until you branch off at about 30 degrees on a footpath for about 0.5km,which then turns right to join the Abbots Wall, a raised track, following the line of the wall built in the 13th Century by the monks of St Augustine's Abbey in Canterbury. After about 1.7km, there is a sharp right turn, where it is no longer possible to walk along the wall, and the path goes south to join the river path going east. There's a short section along the river and then the path turns inland. When it looks as if you need to go through a dense hedge, do so! There are steps up, a left turn, then steps down to cross a small wooden bridge. The path then zig-zags across the fields towards the landmark of Minster Church. The path crosses the railway before turning right into Watchester Lane to make the entrance into Minster-in-Thanet. There's a pilgrim stamp at St Mary's Church, Minster-in-Thanet (open all day every day), and at St Mildred's Priory, Minster Abbey. Tours of this enclosed Benedictine Abbey are available Monday to Friday from 2:45 p.m. until 4 p.m., (1st May to 30th September only) and Saturday mornings from 11 a.m. until 12:00 noon (Throughout the year). Tours can also be arranged by appointment, by ringing Sr. Benedict on 01843 821254 . The Corner House Restaurant in Minster (Winner of the Taste of Kent Awards 2015) offers a small discount to those with pilgrim passports. From the main entrance to the Abbey, turn left and cross the road to a small street called Durlock. This leads into fields and takes you across the railway. Walk along the field edges by the railway, and cross straight over when you reach a small road. The path dips under the bridge for the new road, and brings you out adjacent to the St Augustine's Golf Course. With great care, as this is a busy road, walk along the Cottington Road, until you reach the St Augustine's Cross on the right (English Heritage, open access). There should be a stamp here for passports, soon. Keep going along this road, until it comes into Cliffsend village,, and turn right into Foads Lane. At the end of the lane turn left and pick up the Thanet Coastal Path, which will lead you to the Hugin Ship and the UK's only signpost to Rome! Go to the far corner of the field, near the St Augustine Trail sign to continue along the path, past the old Hovercraft slipway, and along the top of the cliffs in Pegwell Bay. Pass the Pegwell Bay Hotel to join Pegwell Road and walk up until there's a right turn down Goodwin Road towards the sea, where you can join the promenade along the seafront or walk through the promenade gardens, until you reach the destination of the Shrine of St Augustine, built by Augustus Pugin in celebration of the life of Augustine. The Shrine is open 10am-4pm daily with masses at midday. Email pilgrimage@augustineshrine.co.uk to make arrangements for pilgrimages. Don't forget the last stamp in the passport! Getting home: frequent buses run from the roundabout on Grange Road to the train station for connections to Canterbury, Faversham, London and beyond. Footnote: Pilgrims on the Camino to Santiago in Spain sometimes walk on further to Finisterre, where St James landed on the coast. There they cleanse themselves in the sea, and some burn clothing or shoes. After a pilgrimage to Canterbury, the Way of St Augustine, to the area where he landed on Thanet in 597, Ramsgate could be the “Finisterre of Kent”, but it's not a requirement of the journey!